Give your metabolism the efficiency and support it needs with Terrain Metabolism, featuring Terrain Ginger, Terrain Kombucha and Terrain Sacred Herbs. Provide effective support your cardiovascular system with Terrain Heart, featuring Terrain Sacred Herbs, Terrain Kombucha and Terrain Turmeric. Brain health is among the fastest-trending topics in natural health, and there is no better way to support the health of your brain than with living botanicals, like those in Terrain Brain, featuring Terrain Peppermint, Terrain Holy Basil and Terrain Sacred Herbs. Your skin is the largest organ of your body and it pays to protect and support it from the inside out with Terrain Skin, featuring Terrain Milk Thistle, Terrain Turmeric and Terrain Holy Basil. 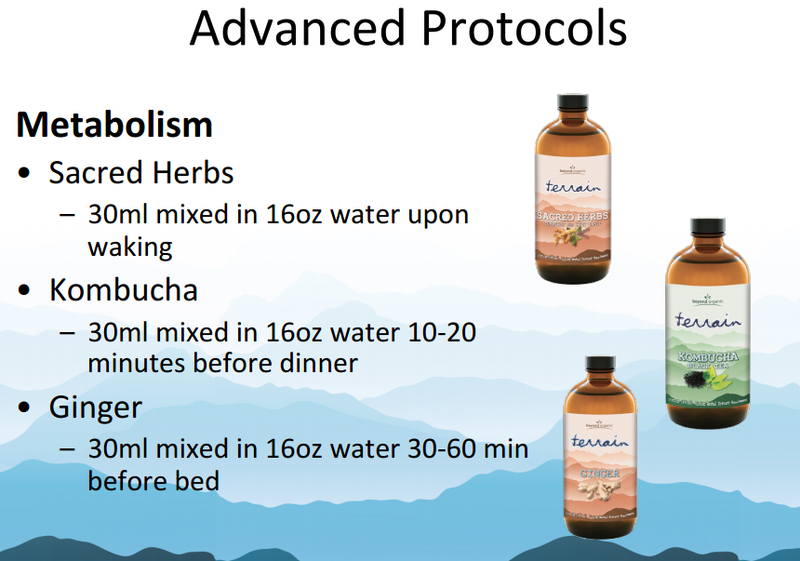 As a bonus, the Terrain Skin health protocol is also the perfect compliment to our Anti-Aging Skin Care line! Terrain Energy, featuring Terrain Kombucha, Terrain Peppermint and Terrain Sacred Herbs is the perfect way to provide your body with a natural energy boost without unnecessary stimulants.